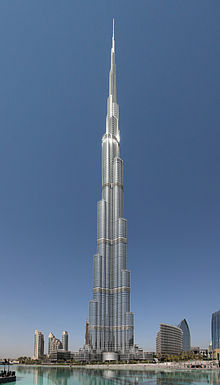 The 828-metre (2,717 ft) tall Burj Khalifa in Dubai has been the tallest building since 2008. The Burj Khalifa has been classified as Megatall. This list of tallest buildings includes skyscrapers with continuously occupiable floors and a height of at least 7002350000000000000♠350 m. Non-building structures, such as towers, are not included in this list (see list of tallest buildings and structures). The international non-profit organization Council on Tall Buildings and Urban Habitat (CTBUH) was formed in 1969 and announces the title of "The World's Tallest Building" and sets the standards by which buildings are measured. It maintains a list of the 100 tallest completed buildings in the world. The organization currently ranks Burj Khalifa in Dubai as the tallest at 828 m (2,717 ft). The CTBUH only recognizes buildings that are complete however, and some buildings included within the lists in this article are not considered finished by the CTBUH. height to top of any part of the building. Spires are considered integral parts of the architectural design of buildings, changes to which would substantially change the appearance and design of the building, whereas antennas may be added or removed without such consequences. The Petronas Towers, with their spires, are thus ranked higher than the Willis Tower (formerly the Sears Tower) with its antennas, despite the Petronas Towers' lower roofs and lower highest point. Until 1996, the world's tallest building was defined by the height to the top of the tallest architectural element, including spires but not antennae. This led to a rivalry between the Bank of Manhattan Building and the Chrysler Building. The Bank of Manhattan Building (aka 40 Wall Street) employed only a short spire and was 282.5 m (927 ft) tall and had a much higher top occupied floor (the second category in the 1996 criteria for tallest building). In contrast, the Chrysler Building employed a very large 38.1 m (125 ft) spire secretly assembled inside the building to claim the title of world's tallest building with a total height of 318.9 m (1,046 ft), although it had a lower top occupied floor and a shorter height when both buildings' spires were excluded. Upset by Chrysler's victory, Shreve & Lamb, the consulting architects of the Bank of Manhattan Building, wrote a newspaper article claiming that their building was actually the tallest, since it contained the world's highest usable floor, at 255 m (837 ft). They pointed out that the observation deck in the Bank of Manhattan Building was nearly 30 m (98 ft) above the top floor in the Chrysler Building, whose surpassing spire was strictly ornamental and inaccessible. At present, the Burj Khalifa tops the list by some margin, regardless of which criterion is applied. As of 2019[update], this list includes all 64 buildings (completed and architecturally topped out) which reach a height of 350 metres (1,150 ft) or more, as assessed by their highest architectural feature. Of these, 32 (50%) are in China. Six of the last seven buildings to have held the record as 'tallest building' are still found in the list, with the exception being the North Tower of the original World Trade Center at 417 metres (1,368 ft) after its destruction in the September 11 attacks of 2001. If the twin towers were not destroyed and One World Trade Center never built, the WTC towers would rank 28 and 29 on the list today. Burj Khalifa in Dubai, United Arab Emirates, is the world's tallest building. Shanghai Tower in Shanghai, China, is the 2nd tallest building. The Abraj Al-Bait Towers in Mecca, Saudi Arabia, is the 3rd tallest building. Ping An Finance Centre in Guangdong, China, is the 4th tallest building. Lotte World Tower in Seoul, South Korea, is the 5th tallest building. One World Trade Center in New York City, United States, is the 6th tallest building and the tallest in the Western Hemisphere. CTF Finance Centre in Guangzhou, China, is the tied 7th tallest building. China Zun in Beijing, China, is the 9th tallest building. Taipei 101 in Taipei, Taiwan, was the world's tallest building from 2004 to 2010; it is now 10th. The Shanghai World Financial Center in Shanghai, China, is the 11th tallest building. The Petronas Twin Towers in Kuala Lumpur, Malaysia, were the tallest buildings from 1998 to 2004, and are still the tallest twin buildings. Willis Tower, formerly Sears Tower in Chicago, United States, was the tallest building from 1974 to 1998. This measurement disregards distinctions between architectural and non-architectural extensions, and simply measures to the highest point. This measurement is useful for air traffic obstacle determinations, and is also a wholly objective measure. However, this measurement includes extensions that are easily added, removed, and modified from a building and are independent of the overall structure. This measurement only recently came into use, when the Petronas Towers passed the Sears Tower (now called Willis Tower) in height. The former was considered taller because its spires were considered architectural, while the latter's antennae were not. This led to the split of definitions, with the Sears Tower claiming the lead in this and the height-to-roof (now highest occupied floor) categories, and with the Petronas claiming the lead in the architectural height category. If the World Trade Center towers were still standing today they would occupy numbers 11 (North Tower at 526.7 m (1,728 ft)) and 31 on the list (or 10 and 30 since it can be assumed the rebuilt One World Trade Center would have never been built). This height is measured from the level of the lowest, significant, open-air, pedestrian entrance to the highest occupied floor within the building. This is a list of buildings taller than 7002350000000000000♠350 m that are currently under construction. More than half of the buildings are located in China. B. ^ Topped out but not completed. ^ "Burj Dubai now a record 688m tall and continues to rise". Emaar Properties. 1 September 2008. Retrieved 1 September 2008. ^ "The Tallest 20 in 2020: Entering the Era of the Megatall". CTBUH. 8 December 2011. Retrieved 19 October 2012. ^ a b "100 tallest completed buildings in the world". CTBUH. Retrieved 27 April 2012. ^ Lynn S. Beedle. "Tallest: Petronas vs. Sears Tower Controversy". Council on Tall Buildings and Urban Habitat. Retrieved 2014-08-24. ^ "CTBUH changes height criteria, Burj Khalifa height increases". Council on Tall Buildings and Urban Habitat. 17 November 2009. Retrieved 18 November 2009. ^ Binder, Georges (August 2006). 101 of the world's tallest buildings. Images Pub. p. 102. ISBN 978-1864701739. ^ "Tall Buildings In Numbers Vanity Height". Ctbuh.org. Retrieved 2013-09-21. ^ "Most of the World's Tallest Buildings Game the System With 'Vanity Height' - Jenny Xie". The Atlantic Cities. 2013-09-09. Retrieved 2013-09-21. ^ "All Global Buildings". CTBUH. Retrieved 25 January 2019. ^ "China tallest building, Shanghai Tower, gets final beam". 3 August 2013. Retrieved 4 August 2013. ^ a b "The Skyscraper Center". buildingdb.ctbuh.org. Retrieved 23 September 2017. ^ a b "Guangzhou CTF Finance Centre : The Skyscraper Center". Skyscrapercenter.com. Retrieved 23 September 2017. ^ "The Skyscraper Center". buildingdb.ctbuh.org. Retrieved 23 September 2017. ^ a b "Lakhta Center : The Skyscraper Center". Skyscrapercenter.com. Retrieved 23 September 2017. ^ a b "Princess Tower | Buildings". Dubai /: Emporis. Retrieved 2012-08-21. ^ "Federation Tower". federationtower.com/. Retrieved 10 February 2018. ^ a b "Raffles City Chongqing Complex". CTBUH Skyscraper Center. ^ "Xi An Glory International Financial Center". CTBUH Skyscraper Center. ^ "One World Trade Center". CTBUH Skyscraper Center. ^ "Kingdom Tower in Saudi Arabia Will Soon Be the World's Tallest Building". Mashable.com. Retrieved 2014-12-28. ^ "Evergrande IFC 1". CTBUH Skyscraper Center. ^ "Corporate Avenue 1 : The Skyscraper Center". Skyscrapercenter.com. Retrieved 23 September 2017. ^ "Diamond Tower". CTBUH Skyscraper Center. ^ "Chongqing Tall Tower". CTBUH Skyscraper Center. ^ "Shandong IFC". CTBUH Skyscraper Center. ^ "One Vanderbilt". CTBUH Skyscraper Center. ^ "Dongfeng Plaza Landmark Tower". CTBUH Skyscraper Center. ^ "Guiyang Financial Center Tower 1". CTBUH Skyscraper Center. ^ "La Maison by HDS". CTBUH Skyscraper Center. ^ "Iconic Tower". CTBUH Skyscraper Center. ^ "Guiyang World Trade Center Landmark Tower". CTBUH Skyscraper Center. ^ "Guangdong Business Center". CTBUH Skyscraper Center. ^ "Citimark Financial Center Phase 1". CTBUH Skyscraper Center. ^ "Coronation Square Tower 1". CTBUH Skyscraper Center. ^ "Xujiahui Center Tower 1". CTBUH Skyscraper Center. ^ "Uptown Tower". CTBUH Skyscraper Center. ^ "Hai Tian Center Tower 2". CTBUH Skyscraper Center. ^ "Galaxy Tower 1". CTBUH Skyscraper Center. ^ "Galaxy Tower 2". CTBUH Skyscraper Center. ^ "Oberoi Oasis Residential Tower;". CTBUH. Retrieved 2012-08-23. ^ "Greenland Group Suzhou Center". The Skyscraper Center. Council on Tall Buildings and Urban Habitat. Retrieved October 21, 2014. ^ "Il Primo Tower 1". CTBUH Skyscraper Center. ^ "Ciel Tower". CTBUH Skyscraper Center. ^ "Agricultural Development Center Tower 1". CTBUH Skyscraper Center. ^ "East Gate Tower". CTBUH Skyscraper Center. ^ "Costanera Center es oficialmente el edificio más alto de Latinoámerica". La Segunda. 2012-02-14. ^ Pacheco, Luis Eduardo. "McMurdo Station, Antarctica - Stratospheric balloon launches". stratocat.com.ar. Retrieved 23 September 2017. ^ Jones, W. Vernon. "Report on the Balloon Program" Archived 2016-03-07 at the Wayback Machine, NASA Astrophysics Subcommittee Meeting. 16 April 2013. Wikimedia Commons has media related to Skyscrapers.